Donovan Smith of PHCC outlines concerns over Superfund site during a press conference at Portland City Hall. Founded in 2012, the Portland Harbor Community Coalition (PHCC) brings together community groups working to elevate the most-impacted people’s voices in the billion dollar federal cleanup of the eleven-mile Willamette River “Superfund” site, Portland Harbor. After decades of industrial pollution and agricultural runoff, the Environmental Protection Agency (EPA) declared the Portland Harbor a Superfund site in 2000. A Superfund is the federal government’s program to clean up the nation’s uncontrolled hazardous waste sites. Now, nearly 20 years later, the site has still not been cleaned up. Portland’s Mayor called the Superfund site on an 11-mile stretch of the Willamette River, from the Broadway Bridge to Sauvie Island, the most important issue people do not know about. The Portland Harbor Community Coalition is working to change that! PHCC is ensuring all communities impacted by the pollution in the Willamette River are represented in the clean-up process and also receive information about the dangers of fishing and swimming in this section of the river. Representing Native, African American, immigrant, refugee, and houseless groups, the PHCC recently helped generate 5,300 public comments, the most ever submitted in the region, to improve the cleanup plan. 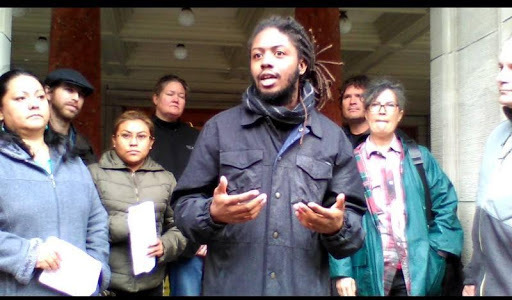 The Portland Harbor Community Coalition (PHCC) is a group of individual community members, community of color organizations, conservation organizations, environmental justice organizations, higher educational institutions, and Native organizations, all invested in the outcome of the Willamette River’s Superfund site cleanup.